The March State and Regional Employment and Unemployment report released today by the Bureau of Labor Statistics gives some cause for concern about the pace of the recovery, but it may be too soon to sound the alarm. Nationally, we added 126,000 jobs in March, a disappointingly low number after the comparatively stronger jobs growth we saw in the latter half of 2014. Growth in March was concentrated in the West and Northeast regions of the United States, while the Midwest and South lost jobs. 18 states saw job growth in March, while 32 states lost jobs. However, it is important not to put too much stock in one month of data, as the trend in state jobs growth over the last three months remains relatively strong. In the first quarter of 2015, 38 states added jobs, with Idaho (2.1 percent), Utah (1.1 percent), South Dakota (1.1 percent) and Washington (1.0 percent) experiencing the largest gains. 12 states and the District of Columbia had declines in their employment numbers, with West Virginia and Alaska experiencing substantial job losses, both down 0.9 percent since December. West Virginia was also the only state to experience a decline in employment over the last year, with jobs down 0.5 percent since March 2014. The other 49 states and the District of Columbia have seen employment growth over the last year, and national jobs have increased 2.3 percent. The trend in state unemployment rates also remains on a generally positive trend over the last three months, although several states continue to have elevated unemployment. 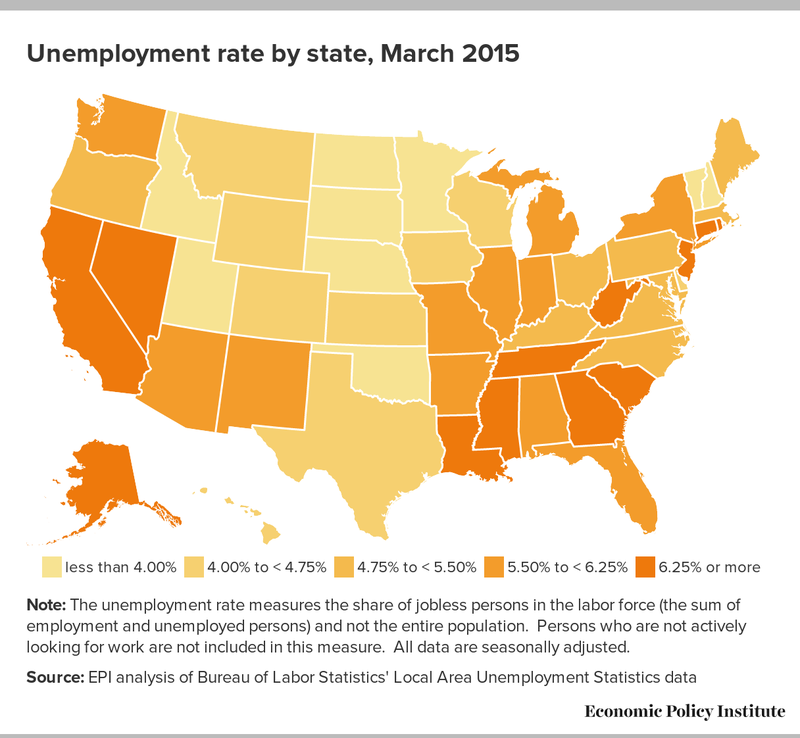 Nine states saw no change in their unemployment rates in the first quarter of 2015, while 12 states had an uptick in unemployment. West Virginia had the highest increase in unemployment over this time period—up 0.7 percentage points—followed by Pennsylvania and North Dakota, both with a 0.3 percentage point increase. West Virginia’s unemployment rate remains the 6th most elevated unemployment rate since the Great Recession started in December 2007, with Louisiana, New Mexico, Maryland, District of Columbia, and Nevada comprising the top five. However, 30 states have seen their unemployment rates decrease in the first quarter, with Oregon (-1.3 percentage points), Michigan (-0.8 percentage points), and Maine (-0.7 percentage points) experiencing the largest declines. However, it is important to note that some of the declines in unemployment were also accompanied by decreases in the labor force as well, notably in Maine (with a labor force down 0.6 percentage points) and Oregon (down 0.4 percentage points). This could be a sign that the unemployment rate is not dropping for “good” reasons—such as strong job growth—but instead is dropping simply because workers are leaving the labor force because of weak job opportunities. 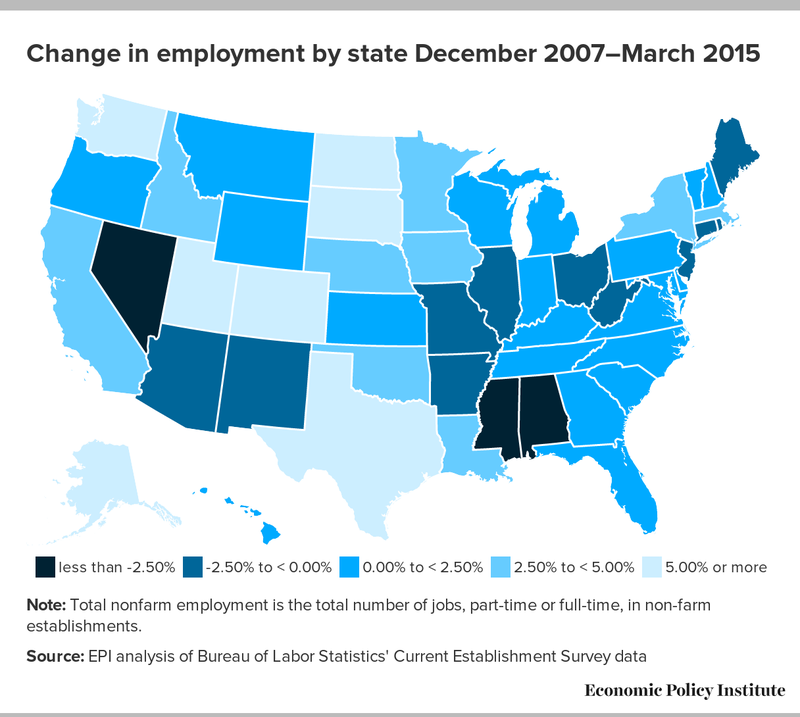 Over the last year, 12 states have seen their labor force decrease, with West Virginia experiencing the largest decrease (-2.6 percent), followed by Maine (-1.8 percent). Although we remain on a positive trend with relatively strong job growth and declines in unemployment over the last year, March’s data might indicate a slowdown. This lackluster growth underscores the need for policymakers to adopt a full employment and wage growth agenda such as EPI’s Agenda to Raise America’s Pay in order to spur the economy toward more broadly shared prosperity.